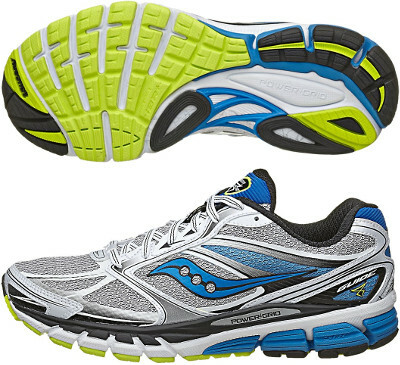 Saucony Guide 8 are stability cushioned running shoes. The Saucony Guide 8 is the latest update of the popular saga from the american brand targeting runners looking for outstanding cushioning-responsiveness balance, mild to medium pronation correction and great value for money. No major changes from its predecessor the Guide 7, but few updates. Regarding the upper, there are new reflective synthetics at heel and vamp to improve visibility under poor light conditions and seamless forefoot design featuring the ultimate in comfort and a sock-like feel. Midsole still uses PowerGrid™ foam and SRC Impact Zone now extends further into the midfoot for improved shock absorption and a smooth heel-to-toe transition. Reconfigured flex grooves in the forefoot and redesigned piece to support pronation control in the midfoot create a more flexible ride, ensuring that the shoe moves with the runner. As well as its predecessor, a lightweight flexible material (IBR+) in the forefoot provides enhanced cushioning and a responsive ride while a carbon rubber material (XT-900) throughout the outsole offers durable traction even on wet paths.